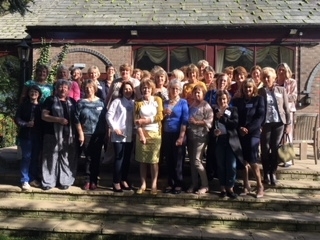 Thirty one OMs met at The Parsonage Hotel, Escrick (Lodge) for a lovely reunion on 30 September 2017. We enjoyed Prosecco with canapés, a delicious buffet lunch and lots of chatter and laughter which lasted well into the evening. On Sunday morning we all enjoyed a visit to the School for the Chapel Service, which we found quite emotional, followed by coffee and cakes and then a tour of the School which brought back so many memories. How times have changed compared to 40 plus years ago!